Start the backswing with an early backward wrist break! Of course this sounds too simple to be true. It violates every rule you ever heard about starting the swing. Your first reaction is that I may have gone completely off my rocker. But it is true - and unless your swing is now everything that you want it to be, you will find out how and why this magic move is made. The wrist break itself is simple enough, actually, though if you have been breaking in the conventional way you may need a little time to convince yourself of what is to be done and to make yourself do it. Since the backward break is the first magic move, let's be absolutely certain you understand what it is. First, hold your right hand in front of you, fingers together and extended, thumb up and the palm squarely facing the left. From that position bend the hand to the right, trying to make the fingers come back toward the outside of the wrist. 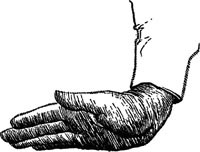 You can't get them anywhere near the wrist, of course, but a person with supple wrists can bend the hand back until hand and wrist form a right angle. This motion of the hand, straight back, is the backward wrist break. The way the right hand should move from the wrist in the early backward break-straight back toward the outside of the forearm, with no turning or rolling. The standard wrist break is quite different. Hold your hand again as you held it before. Now, instead of bending it backward, bend it up, so that the thumb comes toward you. That is the orthodox, accepted wrist break. Forget it. You will no longer need it. To make the backward wrist break we merely push the heel of the right hand down against the big knuckle of the left thumb. This is a downward pressure of the heel on the thumb. 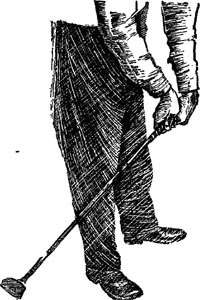 When it is done, without moving the hands otherwise, the right hand breaks backward at the wrist and the left hand breaks forward or inward, the back of the left hand going under and facing, in a general way, toward the ground. How the backward break is made, with the heel of the right hand pressing down on the knuckle of the left thumb. The back of the left hand begins to turn down and under. How not to make the break. Wrists and hands have rolled, the back of the left hand has turned upward. The right hand is rolling too, instead of bending straight back. At this point the club will have come back slightly inside the projected line of flight but the club face will not have opened. The face will be at about a 45-degree angle with the ground and, as you stand there, you will not be able to see any of it. How the backward break looks from the side. Note the bend in the left wrist as the back of the hand turns down, and the position of the right wrist. Notice also that the face of the club has not opened.